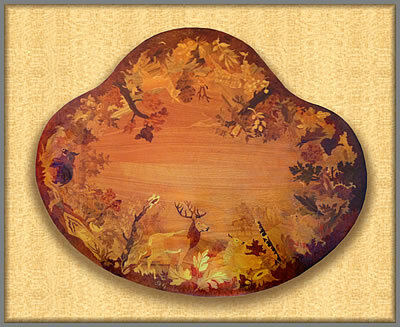 August's update brings you a lovely couple of the Buchschmid and Gretaux Wood Inlay Company's 'Four Seasons' tables. These are spectacular pieces of practical furniture featuring wonderful designs depicting the German countryside throughout the changing seasons of the year from the chill of winter on to the warmth of summer - most desirable! Our next two pictures display a crafty card game taking place with a little bit of 'card sharp' shenanigans being used to hoodwink the other players. The end result of this malarky is displayed in the second picture. 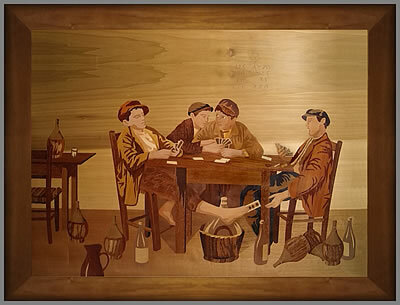 Check them out, they tell a brilliant story in just two marquetry / wood inlay pieces. They say a picture conveys a thousand words, well these ones do! Our August update brings you some more examples of the popular and highly collectable Buchschmid and Gretaux 'Four Seasons' series of tables. These tables, which you see on the right, were bought by Mary Harrington's parents when they lived in Germany in the'fifties'. The tables still retain their original glass tops. These glass tops were made to special order and were designed to protect the table surface (you can read more about these on page 24 of this series, just click the link lower down on this page). Although the finish or varnish used on these tables is very hard wearing, it is possible that climatic variations and general wear and tear can eventually take their toll on the surfaces. Mary has certainly done the right thing by keeping these shaped glass tops on the tables. The evidence of the photos alone go to prove their worth! 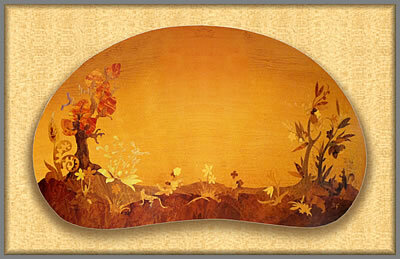 The original marquetry / wood inlay work looks as good as the day it left the Buchschmid and Gretaux workshops. 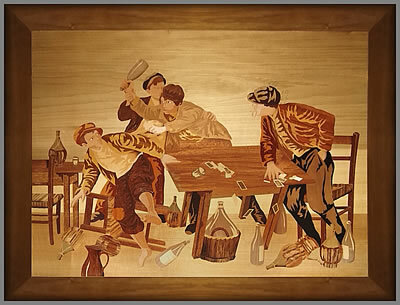 The next two marquetry pictures were sent in to us by Lisa DeMarco. They were given to Lisa by her Grandmother who originally purchased them in the 1960's. Lisa asks us if we can help with any information about them. Well, we have to admit that, that is rather tricky as there are no real identifying features as to the maker of these pictures. From the look of Lisa's photos the marquetry appears to be well excecuted and the veneers are well chosen with good colour matching. Quite often professional makers attach labels and stickers to the rear of the picture to provide a level of authentication. They will even do this with 'one off' customised pieces; this was standard practise with B & G and most other professional practitioners of the marquetry / wood inlay art and craft. If any of you can help us identify the maker of these splendid pictures we would love to hear from you. Click the above button to return to page 41 of "Can You Help"